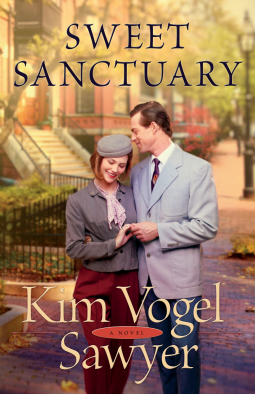 Thanks to NetGalley, I get to share Sweet Sanctuary by Kim Vogel Sawyer with you! Lydia Eldredge longs to provide a sanctuary for her son, Nicky. But a constant threat comes from Nicky's drug-addicted father, who wants the boy and seems willing to do whatever it takes to get him. Dr. Micah Hatcher serves the immigrant population in Queens, but under cover of darkness he provides another service that must not be discovered lest his and his brother's lives be in danger. When Lydia and Micah's paths cross, they are suddenly wrapped up in each other's callings. Through unforeseen twists and turns, they seek a refuge of safety--for Nicky, for themselves, and for the needy people God unexpectedly puts in their lives. I think of Kim as a 'keeper' author – her books don't get swapped or donated - they stay on my shelf, and I always jump at the chance to review her newest offerings. So, I was surprised when I felt hesitation to read Sweet Sanctuary. The blurb just didn't sound like something I have come to expect from Kim. A drug addict? A mother keeping her son away from his father? Another man that the mother seems she will 'fall in love' with? Ah, all is not as it seems! First of all, I expected a contemporary setting – it's not. The book is set in 1944, near the end of WWII. My husband and I just watched a documentary on the Kindertransport and America's resistance to be involved, so I loved seeing that subject in Sweet Sanctuary. Kim wrote a great story with some suspense and a wonderful theme of the amazing change that happens when one gets saved! I don't want to give any spoilers, but I will say that Kim continues to be a 'keeper,' and Sweet Sanctuary is actually at the top of my now favorites! I loved it and didn't want it to end! In fact, I know Kim doesn't usually write sequels, but this one is worth continuing! Take a peek inside the book HERE. Thank you to Kim and Bethany House through NetGalley for sending me a copy to read and review!